Choose the Enrollment Special That Works For YOU! Starting Black Friday and running through CyberMonday! 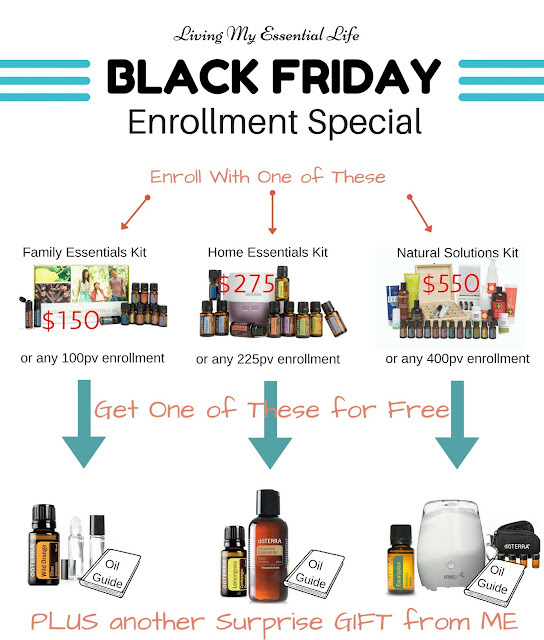 Enroll November 25 - November 28, 2016 and get these deals!! 5ml Lavender, Lemon, Peppermint, Melaleuca (tea tree), Oregano, Frankincense, Deep Blue, Breathe, DigestZen, OnGuard. PLUS OnGuard Beadlets & Peppermint Beadlets. & a Lemongrass 15ml Oil from me! 15ml Lavender, Lemon, Peppermint, Melaleuca (tea tree), Oregano, Frankincense, Deep Blue, Breathe, DigestZen, OnGuard. *PLUS a doTERRA Petal ultrasonic diffuser. & a Wild Orange 15ml Oil from me! & a Citrus Bliss 15ml Oil from me! *You will be added to exclusive groups created just for team for support, education, training and business building. PLUS exclusive giveaways and offers. *Select “wholesale customer”. Fill in personal information. *Then pay and check out. After you are enrolled, add me as a friend on Facebook…Melissa Ann Goers. Message me to let me know you purchased your starter kit and I will add you to my groups! Can't wait to get you started on your essential oil journey! Offer available with me only November 25 - November 28, 2016 .